According to multiple reports, it appears a lightweight rematch between bitter rivals Jaime Varner and Donald Cerrone will go down at WEC 51 on September 30th. The mulligan was first reported by Sherdog.com earlier this month,but Varner’s management claimed they were perusing a championship scrap against 155-pound king Ben Henderson. It appears WEC brass has other ideas following the former champ’s controversial draw with Kamal Shalorus at WEC 49 last month. Varner confirmed his showdown with “The Cowboy” on his official website on Tuesday. “So my next fight will be a rematch with Donald Cerrone I hope to be the co-main sept 30. So any questions that were left after the last fight will be answered sept 30!” Varner wrote. 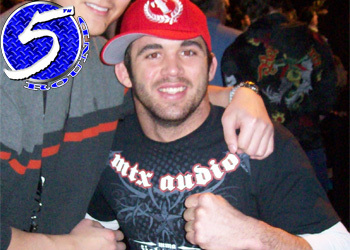 Varner and Cerrone initially met for the lightweight crown at WEC 38 back in January 2009. “C-4” took home a technical split decision after eating an illegal knee to the head in the 5thRound. The event is scheduled to take place inside the 1STBANK Center in Broomfield, Colorado. WEC featherweight champion Jose Aldo will be defending his strap against top contender Manny Gamburyan in the night’s featured fight.